Orange CA offers visitors a chance to step back in time with a stroll through the Old Town District, which contains many historic homes built prior to the1920s. While these quintessentially Californian homes are certainly charming to look at, some of them might be dangerous to live in without proper renovations. In addition to keeping your older Orange CA home up to code, you also need to be on the lookout for old asbestos-containing building materials. While these materials were once thought to be safe, we now know that they are best handled through asbestos removal Orange CA. Do You Need Asbestos Removal? Asbestos fibers are mainly dangerous when they are inhaled. 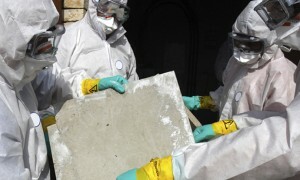 Dust and fibers coming off of broken asbestos-containing ceiling tiles, flooring, roofing materials, and insulation are common causes of asbestos-related lung problems and cancer. If you think you have asbestos in your home, you should have an expert evaluate the material before you even consider disturbing it. If asbestos is found, you must not attempt to complete the removal yourself. Instead, you need to get professional asbestos removal Orange CA. Only the pros will have the resources and knowledge needed to safely remove and dispose of the asbestos. Once asbestos fibers enter your ductwork, it’s only a matter of time before they spread throughout your entire home. Therefore, it is very important to keep asbestos-containing materials well away from your HVAC system. Asbestos-containing insulation surrounding your ductwork is especially problematic. Fortunately, you can count on the pros from AQHI Inc. to safely perform asbestos duct removal Orange CA. We can help you keep the air in your home clean and safe. Safety is a top priority at AQHI Inc. Our employees are fully trained in safety protocols as well as industry best practices for the removal and disposal of asbestos. Our employees always wear full safety gear and they go through a decontamination process prior to leaving the work zone, to ensure that they do not inadvertently track asbestos dust into other areas of your home or business. We also seal all workspaces and filter the air during and after work to further ensure that we capture all stray asbestos fibers and leave you with a safe and healthy environment. Our asbestos removal office for Orange CA is open Monday through Friday between 8:00 AM and 5:00 PM and closed for lunch from noon to 1:00 PM. With advance notice, projects can be scheduled for weekends, early mornings and evenings.